This approximately true-color view of Marquette Island comes from combining three exposures that Opportunity's panoramic camera (Pancam) took through different filters during the rover's 2,117th Martian day, or sol, on Mars (Jan. 6, 2010). NASA's Opportunity rover has discovered a peculiar rock on Mars thatscientists think originated deep within the red planet. The stone could reveal new secrets about the makeup of Mars'interior. Dubbed "Marquette Island," the rock is a darkboulder not much bigger than a basketball that sits on a rippled Martian plain. "Marquette Island is different in composition andcharacter from any known rock on Mars or meteorite from Mars," said Opportunityprincipal investigator Steve Squyres of Cornell University in Ithaca, N.Y. "Itis one of the coolest things Opportunity has found in a very long time." Opportunity and its twin rover, Spirit, landed on Mars in2004, and have drastically outlived their original 90-day mission plan. WhileSpirit is currently stuckin a sand trap with two broken wheels, Opportunity is still roving free. In all of its 11 miles worth of traveling, Opportunity hasfound only one other rock of comparable size to Marquette Island and scientiststhink it was ejected from a distant crater. Called ?BounceRock,? that stone closely matched the composition of a meteorite thatlanded on Earth, but was thought to have originated on Mars. The coarse-grained texture and basalt composition ofMarquette Island indicates that it cooled slowly from molten rock, allowingcrystals time to grow. That means that it likely originated deep in the crust,not at the surface where it would cool quicker and have finer-grained texture,scientists say. "It is from deep in the crust and someplace far away onMars, though exactly how deep and how far we can?t yet estimate," Squyres said. In contrast, most Martian basalt rocks that Spirit andOpportunity have encountered have different textures and composition. At first, scientists thought Marquette Island could be ameteorite, but it appears to have a much lower nickel content than other meteoritesOpportunity has found. And Marquette Island's interior contains more magnesiumthan typical Martian basalt rocks. "It?s like having a fragment from another landingsite," said Ralf Gellert of the University of Guelph, in Ontario, Canada.Gellert is lead scientist for the alpha particle X-ray spectrometer onOpportunity?s robotic arm. "With analysis at an early stage, we?re stillworking on some riddles about this rock." The rover team used Opportunity?s rock abrasion tool togrind away some of Marquette Island?s weathered surface and expose theinterior. This was the 38th rock target Opportunity has ground into,and one of the hardest. 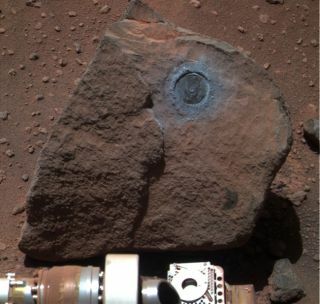 The tool was designed to grind into only one Martianrock, and this rock may not be its last. "We took a conservative approach on our target depthfor this grind to ensure we will have enough of the bit left to grind the nexthard rock that Opportunity comes across," said Joanna Cohen of HoneybeeRobotics Spacecraft Mechanisms Corp., in New York, which built and operates thetool. While Marquette Island is intriguing, Opportunity couldn'tstop too long to investigate ? it left the site Jan. 12. The rover is mid-wayon a journey toward a much larger crater, Endeavour, that scientists think willoffer a host of scientific prospects. "We?re on the road again," said Mike Seibert, arover mission manager at NASA?s Jet Propulsion Laboratory in Pasadena, Calif.?The year ahead will include lots more driving, if all goes well. We?ll keeppushing for Endeavour crater but watch for interesting targets along the way wherewe can stop and smell the roses."